This is our heavy hitter, heavy in weight and heavy in fabric technology. Not quite Eddie the eagle but you get the idea. The Eddie packs some punch, fully windproof stretchable material with DWR (Durable Water Repellent) coating great for keeping warm on those winter rides. That combo is further enhanced via 3M reflective strips on the back, long lasting sublimation colour impregnation, covered zipper at the front, strong jersey grippers on the bottom, and a high collar to keep the warmth in. The fabric is subtly striped to give the Fast Eddie some depth, that depth is given some support by the very robust weighing (454 g/m2) fabric. You won't be left out in the cold with this bad boy, get amongst it. Windproof, water-repellent, fleece lined, and breathable make for a complete winter riding jacket. Relaxed fit, to accommodate a base layer underneath. Striped milk silk + white polar fleece fabric. Generous sized triple back pockets + zippered bonus pocket. Full length YKK hidden zipper with zip garage up top. Reflective stripe on the bottom of the rear pocket. Longer dropped back than a standard jersey to protect the rear end in wet conditions. Skid proof silicone grippers to stop the jersey riding up. Sublimation printing technique utilising Italian Manoukian-Argon ink, the stable colour technology provides vibrant colours that last for years. Team up with a thermal base layer for those extra cold morning/evening rides. Your height and weight are the best guide to your size for cycling tops. The upper end of the range will be tighter and the lower of the range looser. Remember tops are mostly slim fit and are designed that way to take moisture away from the body, if you prefer a looser fit go up one size. 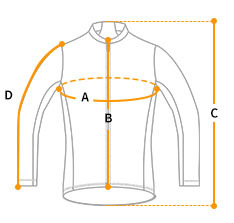 Example MEN: A 78kg man at 178cm tall will wear size LARGE in a cycling top, but will be tighter fitting given it is at the top of the band.